Some G-Shocks are tougher than others. Like the “Mudman” series, for example. The most affordable and popular watches in Casio’s professional “Master of G” line. In today’s review, we’re taking a closer look at both of them. To find out if they’re still worth the money compared to newer, more advanced G-Shocks. Both features give “Mudman” extra protection against water and mud. They also make it tougher compared to other G-Shocks. Finally, every G-Shock Mudman comes with an iconic warthog logo on the caseback that gives the watch some character. Side note: There is also the imported Japanese domestic G-Shock Mudman GW9300 that comes with Multi-Band 6 radio signal and a carbon-fiber reinforced strap. The main difference between two Mudmen is the twin Sensor on 9300 that comes with a digital compass and a thermometer. 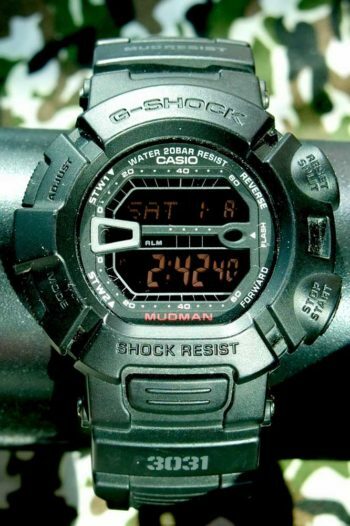 The current generation 9300 Mudman was released in 2011 as the successor to the G-9000 and GW-9000 Mudman models from 2006. Below, you’ll find a short review of both models, including their pros and cons and what they’re best for. Since the G9300 is “newer” and more popular, it’s going to be the first on the chopping block. Mudman G9300’s case is made out of strong resin and the watch comes with a mineral display. This is your standard “workhorse” G-Shock construction with no frills attached. Side note: Mineral screens on normal watches are notoriously easy to scratch. 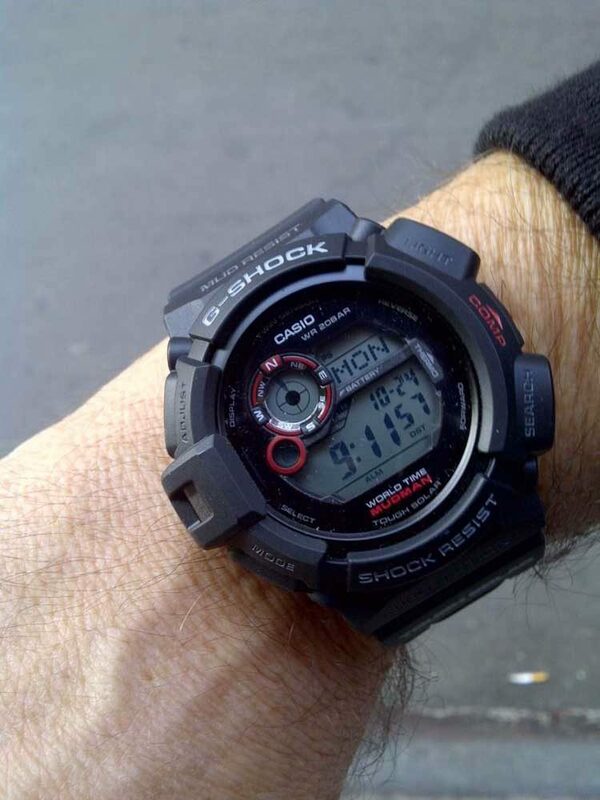 But on every G-Shock, the screen is protected by the protruding bezel edges, which make it essentially scratchproof. As you can see on the image, the resin of the case extends over the edges of the caseback, giving the watch extra protection against water and mud. You can also see the protected buttons – the second part of the unique “Mudman” construction. If you’re into “tactical” watches, you’ll love the design on G9300. The “compass eye” on the watch demands attention. Combined with everything else, it gives the watch a very “military” look. Side note: We included both Mudmen watches in our Best Military G-Shocks list. There are plenty of tactical colors available, but I’ve always liked how the red compliments the black on the main model. The reviews on Mudman are outstanding. People rave about quality, display, ruggedness, and feel of the watch. Mudman is (obviously) shockproof and 200m waterproof. Side note: If you go for the Japanese GW9300 Mudman model, you’ll also get the carbon-fiber reinforced strap that the normal model doesn’t have. The buttons are big and easy to operate even with gloves on. Because of the added protection, they’re harder to press than on normal G-Shocks. I like it since it gives the watch a “more rugged” feel. They wear in over time. 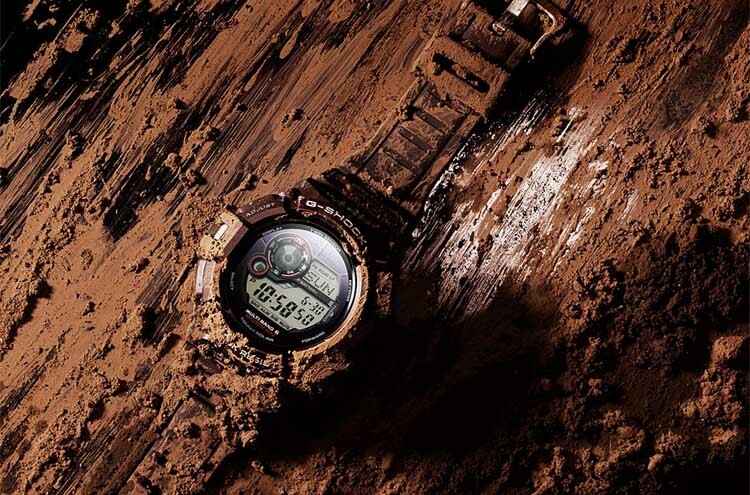 As with most G-Shocks, Mudman has “bumpers” in the middle of the watch that help you find and hit the right buttons. After some practice, you’ll be able to operate the watch without looking. Below is a short review of all the features that G-Shock Mudman G9300 comes with, including how/where you might find them useful. Tough solar battery is great to have, as you’ll never have to worry about the battery running dry. The solar battery will work for 9 full months on a full charge without any additional daylight exposure. Side note: All solar G-Shocks come with a battery level that shows how much charge you have left. There are also a 48-city world time and a moonphase tracker features built into the watch. World time is great for traveling and you can use the moon graph to track when the full moon is going to come out. The twin sensor features a digital compass and a thermometer. The compass is combined with the thermometer – they appear together on the display when you press the button on the right side. When the compass screen is not in use, it visualizes the seconds. To get an accurate temperature reading, you’ll need to keep the watch off your wrist for at least 5 minutes, 15 for maximum accuracy. Also, note that the temperature reading will stay on the display for around 18 seconds with no way to save or record it. If you want Casio’s Multi-Band 6 radio signal calibration, you’ll have to go with the GW9300 model, as the normal “Mudmen” don’t have it. 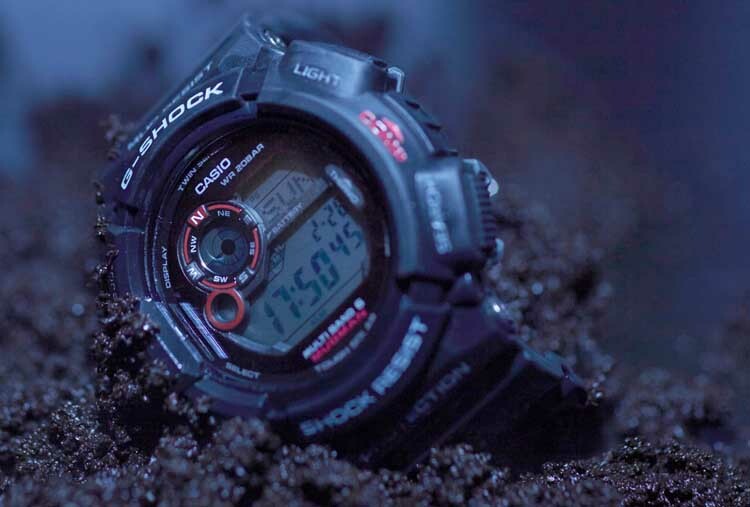 Like all G-shocks, Mudman comes with a backlight illuminator for visibility in darkness. There is a hands-free backlight activation mode – when turned on, you can activate the backlight by moving your wrist from horizontal into a vertical position. You can set the backlight either on 1.5sec or on 3sec. Unfortunately, there is no way to keep the light on while switching through different modes on the watch. Eventually, you’ll just memorize the button combinations that you need and the lack of a backlight will stop being a problem. Still, it’s one of the most common complaints that people have with the Mudman. You can mute the buttons. It’s great to be able to operate the watch without the annoying “beeps”, especially if you’re in the middle of the meeting. Finally, you can cycle the time forward and backward. A very basic and convenient feature that Casio has started removing from some of their watches recently. Mudman G9300 has a diameter of 53mm and a thickness of 18.2mm. At ~70 grams in weight, the G9300 is not too light and not too heavy. For comparison, a steel Seiko SKX007 diver would be 150g – double the Mudman’s weight. Mudman G9300 is around “medium” when compared to other G-Shocks. Especially considering that it’s a “Master of G” watch – those are known for being huge. 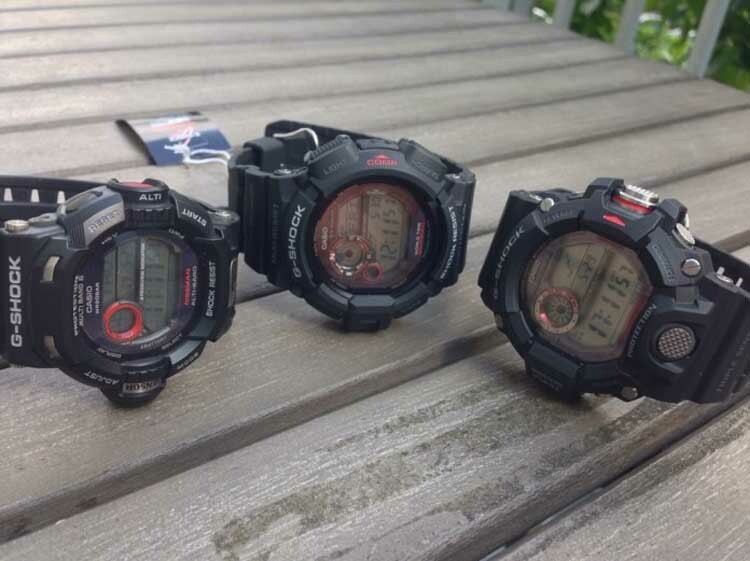 For comparison, the smallest G-Shocks (squares) are around 43mm in size and the biggest ones are 60mm. Despite the large size, it’s a pleasure to have the Mudman 9300 on my 7.25″ wrist, and it never becomes uncomfortable or intrusive in any way. G9300 wears comfortable mostly because of the way that the strap integrates with the lugs. You’ll also be fine with smaller wrists – down to 6.5″ or so. I have a friend who wears Mudman daily with a wrist of 6.75″, which is smaller than most. He swears by the comfort of the watch. 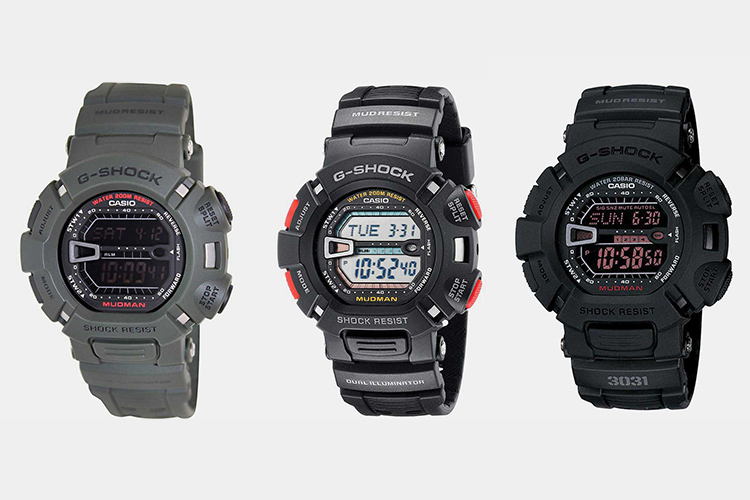 Side note: If your wrist is smaller than 6.5″, take a look at a smaller G-Shock like DW-5600. Mudman’s black look with colored accents fits well military or police outfits. 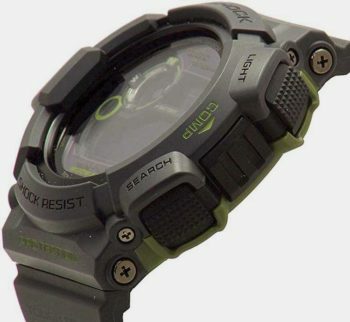 Aside from that, the style of the watch is very “rugged” and “outdoorsy”. Because of the thickness of the case, you won’t be wearing this watch on formal occasions. G9300 is hands down the best G-Shock Mudman you can get. 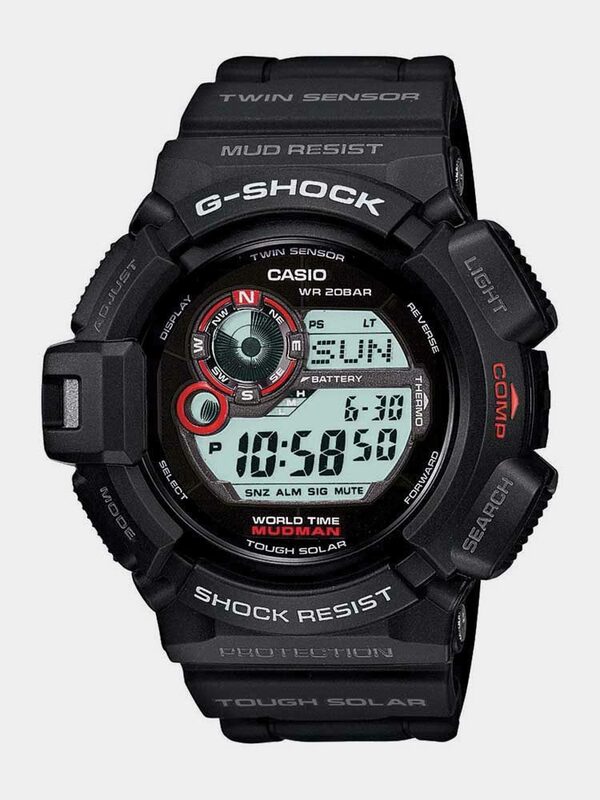 One of the toughest G-Shocks out there, it has a nice wrist presence, it’s not too heavy or too light. It’s great for a full day of wear and pretty much any activity – sports, job carry, military, and even casual wear. G-Shock Mudman G9300 is the most affordable of the “Master of G” watches – and a real bargain considering that you’re getting the twin sensor. 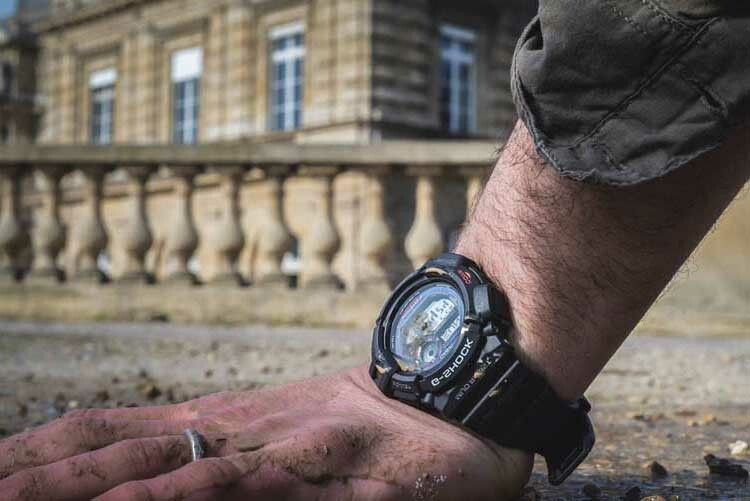 G-Shock Mudman G9300 is for you if: You’re looking for the toughest G-Shock ever made without breaking the bank, or you want the twin-sensor functionality on a budget. Mudman G9000 is the smaller brother of G9300. The features of G9000 are less advanced, but it also retails a good $50 below the G9300 which makes it a solid budget G-Shock choice. Unlike its bigger brother, G9000 comes with a separate front backlight button, which makes operating the watch in gloves more comfortable. You get Casio’s standard resin case with a mineral dial that is protected by the bezel edges. The rubber strap is sturdy and long enough to fit larger wrists. As with G9300, the edges of the caseback are covered in rubber to make them mud-resistant. You also get the protected buttons and the cool warthog logo on the back of the case. Side note: The hands-free backlight turns off automatically after 6 hours to save the battery, as this is a non-solar G-Shock. At 50mm in size, the Mudman G9000 is a tad bit smaller than its bigger brother. It wears comfortable, but at the end of the day, it’s still a bulky watch that you’ll be using mainly outdoors. You’ll notice that the case design is different from most other G-Shocks – the buttons and the bezel “pop” out of the case towards you, giving the watch a unique look. The nice red “Mudman” print at the bottom of the dial fits the styling of the watch. Mudman G9000 is one of the best-looking G-Shocks out there. Especially the all-black negative display model with red accents. It’s easily one of the best-looking G-Shocks to be had for this money. G9000 is the toughest G-shock you can get under $100. It punches way above its price point with the mud-resistant construction, the world time feature, and a hands-free backlight functionality. 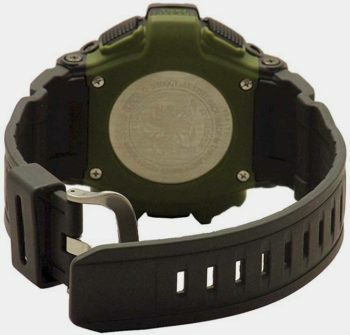 The watch has plenty of character with its “popping” features, warthog on the case back, and the overall tactical look. 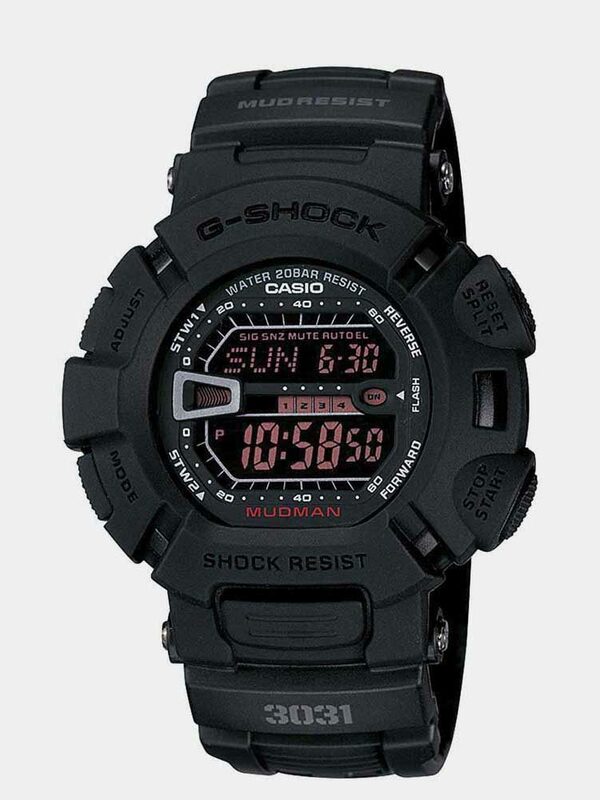 G-Shock Mudman G9300 is for you if: You’re looking for the toughest G-Shock under $100. Or if you want a Mudman, but don’t need solar power and the compass/thermometer of the more expensive G9300.